This was the first game of a championship triple-header at beautiful Jethawk Stadium in Lancaster. It was starting to warm up already in the Antelope Valley desert as these two AAA Division teams prepared to face off to see who would claim this years' Summer title. So with that being said, let's get right to the action! The Red Sox draw first blood in the top of the 1st inning. Leadoff hitter Martin Orozco starts things off with a single to right. 3rd baseman Brady Conlan follows with a single to left. With 2 on and nobody out, 1st baseman Loyd Wood hits an RBI single. Mark Glennie follows by grounding into a double play; with a run scoring in the process. The Sox settle for 2 runs in the inning to take the early 2-0 lead. The Sox come up in the top of the 3rd inning; still leading by a 2-0 margin. Martin Orozco leads off with a walk. Brady Conlon is hit by a pitch; sending up Loyd Wood who got an RBI single in his last at bat. He duplicates the effort with an RBI single to center. Mark Glennie follows with a single. A run scores on a fielding error. The Sox end up with 2 runs in the inning to take a 4-0 lead through 2 1/2 innings of play. Still up 4-0 as we entered the top half of the 4th; the Sox' catcher Casey Gergen draws a walk. Martin Orozco follows with a single. Brady Conlon is it by a pitch; with a run scoring on a fielding error soon after. Loyd Wood soon steps up to the plate; having gone 2 for 2 with 2 RBI's already it this contest. He adds to his stats with a 2-run single. The Sox end up with 3 runs in the inning to take a commanding 7-0 lead through 3 1/2 innings of play. But the Angels finally show a sign of offense in the bottom of the 4th. Center fielder Ron Lauer is hit by a pitch to lead things off. He is sacrificed over to 3rd and soon scores on yet another sacrifice grounder by Charlie Hirsh. The Angels get on the board with 1 run in the inning; now trailing 7-1 through 4 complete. But the Red Sox steal that lone run back in the top of the 6th. With 2 outs in the inning, Mark Glennie takes one for the team. He steals 2nd base shortly thereafter. He's followed by Marty Orozco Sr. who singles him home. The Sox get 1 run in the inning to extend their lead back to 7 runs; up 8-1 through 5 1/2 innings of play. The Angels come to bat in the bottom half of the 6th inning; knowing that they were running out of time in this championship contest. DH Chad Olsen leads off the inning with a single. Brian Corralejo is the next batter and he reaches base safely due to an fielding error; the only error on the day for the Sox. The next batter would ground into a double play; sending up leadoff hitter Ron Lauer who slaps an RBI single to left. Moments later, Lauer scores from 3rd on a wild pitch. The Angels get 2 runs in the inning to cut the lead to 5; now down 8-3. However, the offense would come too little too late, as the 2 Angel runs would prove to be that last of the ballgame. 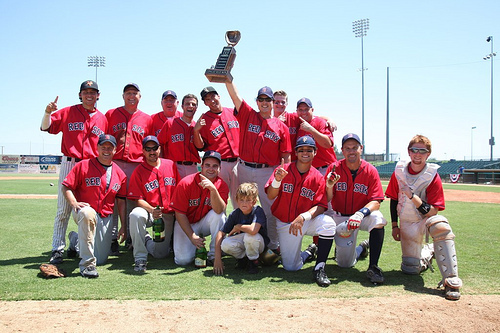 The Red Sox hold on to win the game; thus claiming the title of 2012 AAA-Division summer champions! Congratulations to the Red Sox on a great season and a strong, successful ending to this 2012 season!